Cooler weather means scarf season in my world. This simple accessory can transform any basic outfit to fabulous in a flash but the biggest bonus is that I never have to worry about whether or not my pants fit. The problem I always have is how to store them. In my mind I think they would look good all folded up and stacked on a shelf but reality sets in and they wind up crumbled in a ball. Insert the hanging scarf organizer. 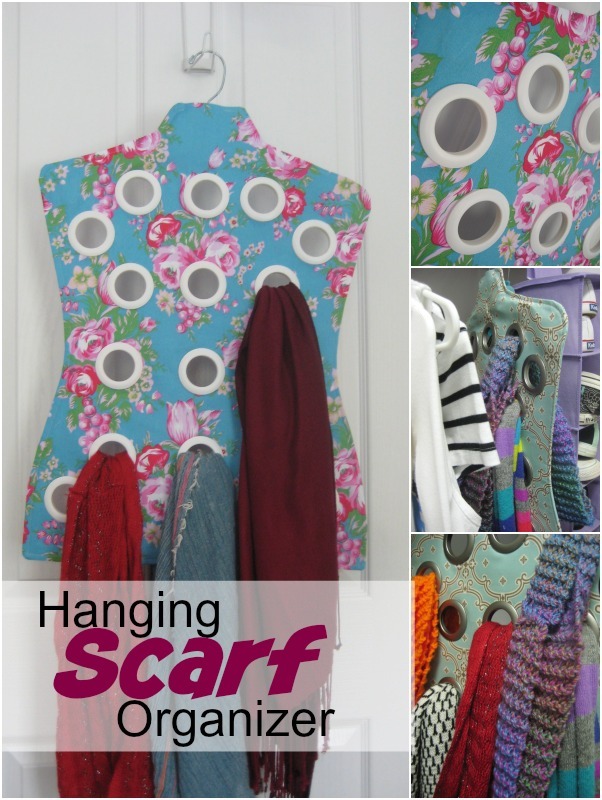 The hanging scarf organizer offers vertical storage for multiple scarves and the ability to see them all at a glance. Love it! TIP: This pattern was designed for a standard plastic hanger. Be sure to double-check that your hanger will fit inside the finished pattern. Adjust as needed. 1. 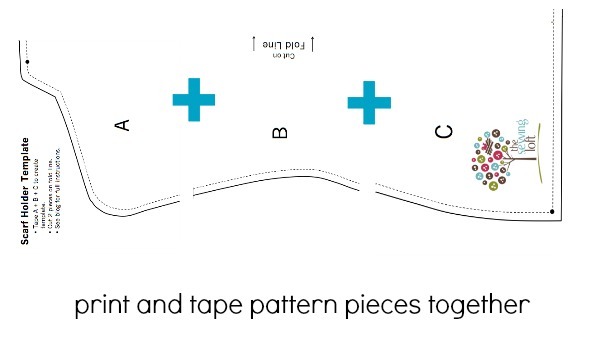 Print out the bodice template and tape together in A, B, C order. 2. Iron and fuse the Decor Bond to the wrong side of the fabric. Cut 2 bodices on the fold. 3. 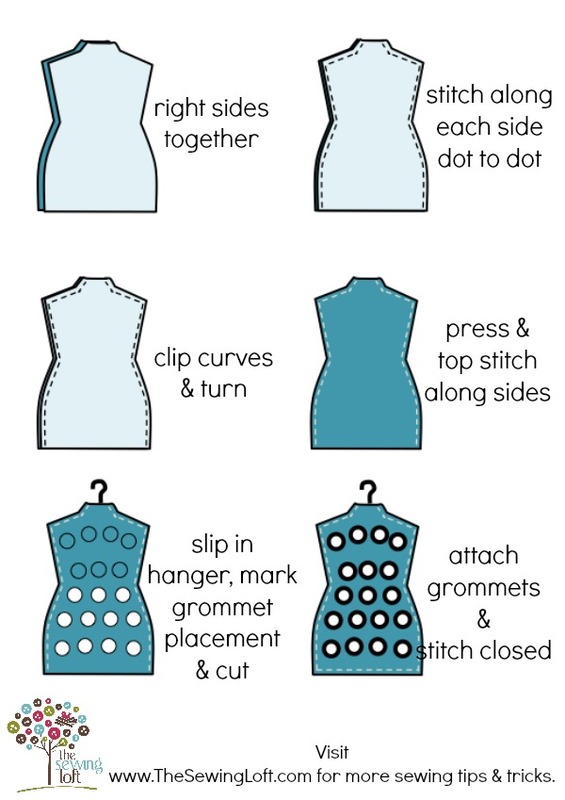 Place wrong sides together and stitch around from DOT to DOT. Repeat on the other side. This will leave a small opening along the top neck area and a larger opening at the bottom. Clip all curved parts, turn right sides out and press. Fold the opened areas towards the inside and press. Top stitch along side seams. 4. 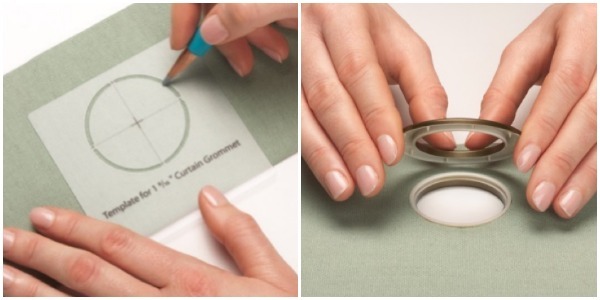 Slip your hanger inside through the bottom opening, mark the grommet placement and cut circles. 5. Grommet installation is super easy! Insert the raised center into the cut out circle on the right side of fabric and sandwich the prong side on the other. Apply pressure with the palm of your hand until you hear it snap in place. 6. It is that simple. You can even take them off if for some reason you do not capture all of the fabric. Click here for additional tips on how to install grommets. Now that you have your scarf organization down, fill it up with a few of these free scarf patterns. This post has been sponsored by Dritz. Their constant encouragement and support of The Sewing Loft means ever so much and I look forward to working with them next week at Fall Quilt Market. Be sure to stop by their booth on Sunday for a few fun Make & Take projects! Wth scf look beautiful. How do IGet the fre pattern? Cute as a…well, button 🙂 That’s an awesome project! Great use for a great product from a great company! This is such a great idea! I have seen these for sale in stores for like $25. I currently use a rubber coated slacks hanger for scarves but cannot see most of them beyond the top layer. How many grommets are in the package? What is the approximate cost of the grommets? I am not familiar with Decor Bond. Is it like a stiff fusible web? There are 8 grommets to a package so, grab a coupon when you head to the store! Great sewing project, it looks pretty easy to do! Thank you for sharing this tutorial!